I am sure you have your list of favorite bloggers to follow, but if you have the intention to stay online for a while, then you should keep visiting and reading others resources, in order to build new connections or simply learn something new. I’ve published a blog post like this last month, and it received a huge response in terms of social sharing, comments and appreciation. In case you have missed it : 8 Must-Read Blogs to Get Inspiration From. Enjoy this list of amazing bloggers, because they share useful content on their sites and you are going to learn interesting new things (the list is not in a particular order). Ryan is well known in the blogosphere since a while already, as he’s living the internet lifestyle. Right now he’s in Fiji, after taking a big decision of leaving his home (read the full story here). 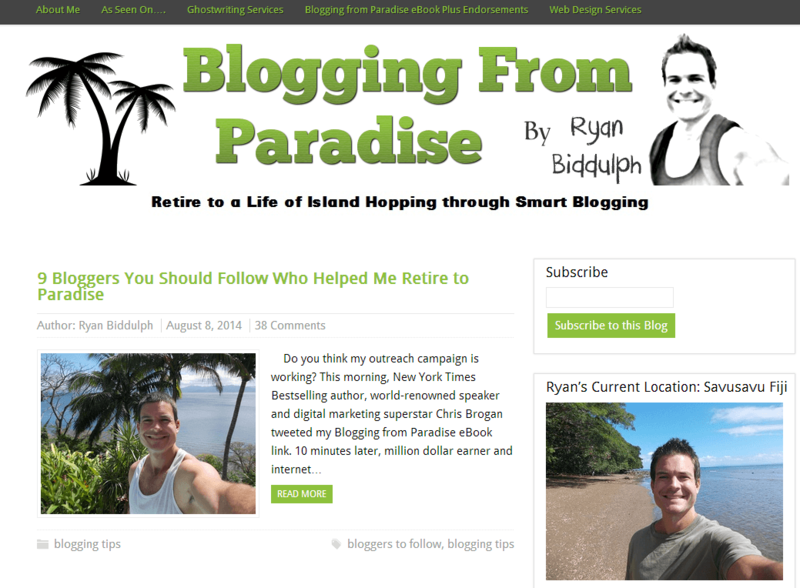 He recently rebranded his blog, with the new title : Blogging From Paradise. This name has never been more appropriate! If your desire is to travel and reach the financial independence, then Ryan is the blogger you should follow to learn how to achieve your goals. I know Daniel for some time already and I think he’s very gifted. In his blog “Reviewz ‘n’ Tips”, he shares outstanding content about WordPress, traffic generation, monetization and more. He offers different services, like content writing, social media marketing help, blog review. Although he’s quite young (20 years old), Daniel is very influential in the blogosphere. Just take a look to his Twitter followers! Adam has been featured on several popular blogs, like Social Media Examiner and Problogger. He shares outstanding content on his site “Blogging Wizard” and if you want to build a successful blog, then I suggest you to subscribe to his mailing list here. I’ve always loved the design of his homepage (just take a look to the screenshot above) : what a creativity! I’ve met Wade at the start of his online career, when he shared with me his story as an ex coal miner. 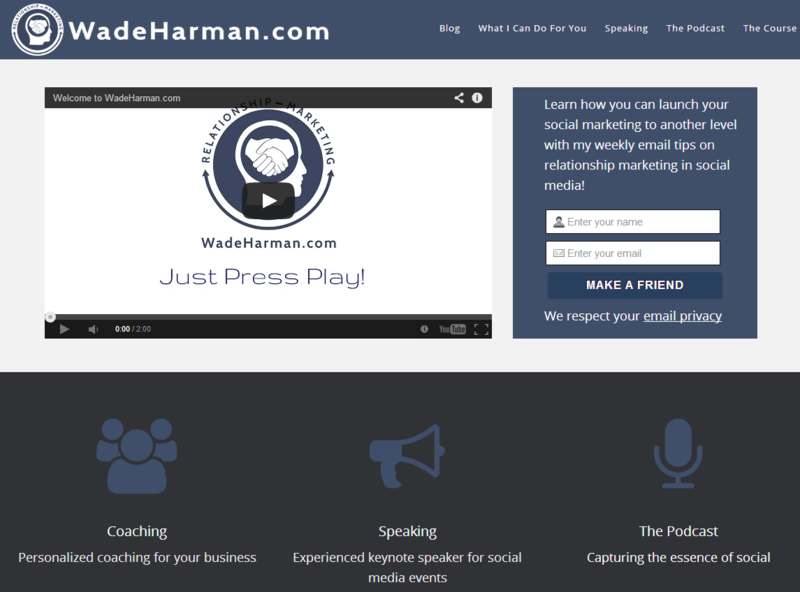 He started his internet journey with BloggersMakeMoney blog, then he has grown very quickly, building a strong social media presence and offering different valuable services on his new site Wade Harman. I suggest you to follow Wade, you will learn a lot from him : he has 15k followers on Google+! If you are online since a while, then you surely know Harsh Agrawal’s blog “ShoutMeLoud“. The site has been live for so many years, that it has become very popular (3000 alexa rank!). 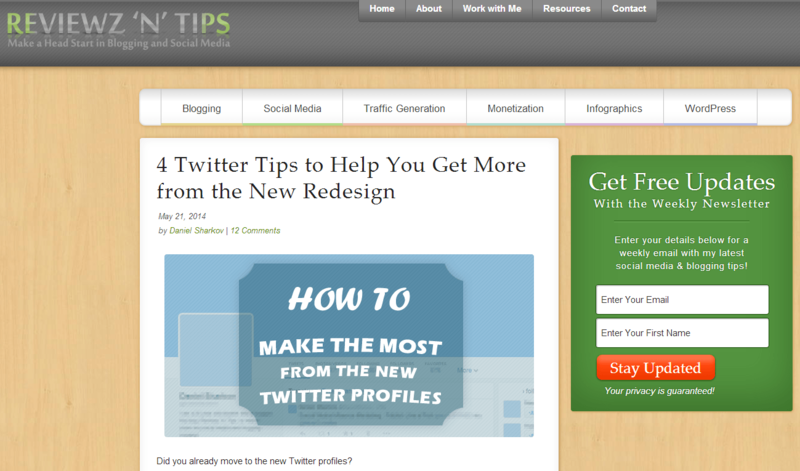 I remember to have guest posted for ShoutMeLoud few years ago : you can find a lot of impressive articles on this blog. Harsh is earning a solid monthly revenue. You may want to learn more about his story here. 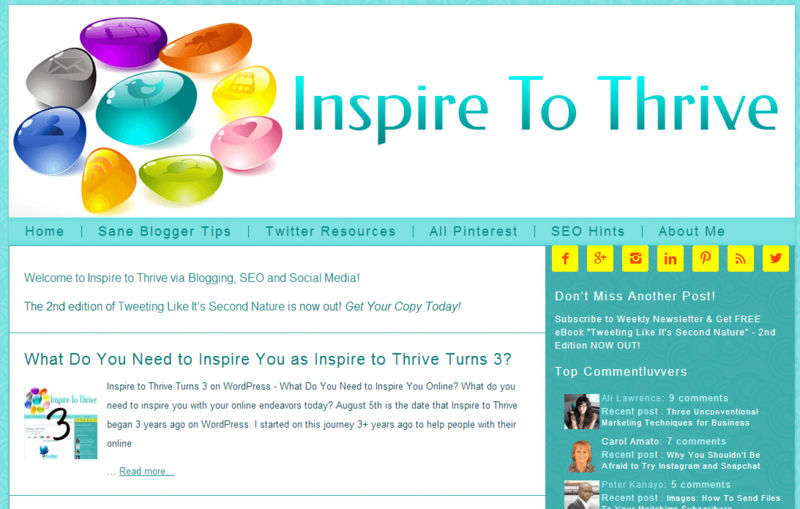 Lisa’s main site is “Inspire To Thrive“, where she shares valuable and interesting content about social media and blogging. She has recently released her eBook : “Tweeting like it’s Second Nature“. Lisa has been always very gentle with me, she’s the kind of person you want to have in your circles. Rebekah is a professional social media strategist, speaker and digital marketing specialist. She has a solid online presence, with a strong reputation. She offers Social Media Business Coaching, and many other services (check them here). In addition to being extremely prepared, she has an amazing smile and following her will enliven your day! 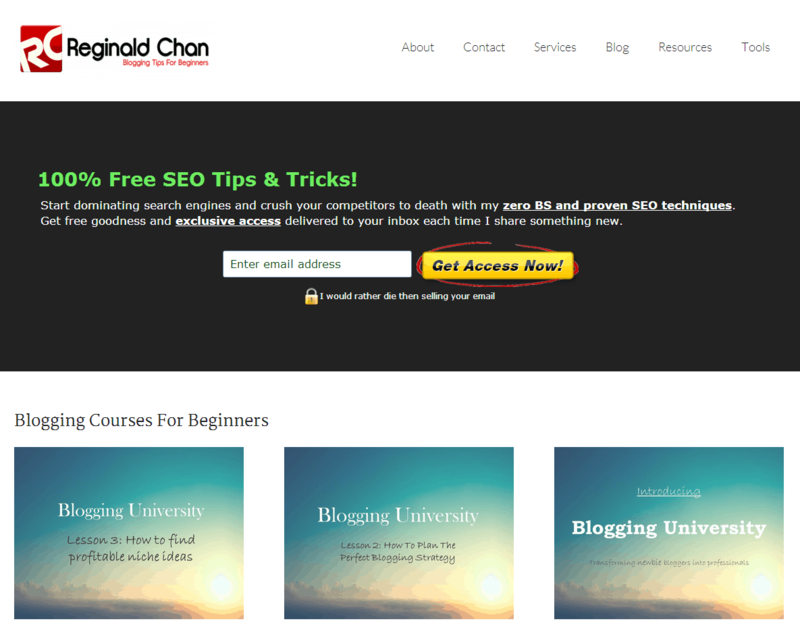 Reginal Chan blog is full of interesting content about social media, SEO, internet marketing and WordPress. He’s offering several services of consultation, check them here. I know Reginald from some time already and I suggest you to connect with him! I hope you will find new names to follow in this list, as they are all interesting people and it’s really worth to get in touch with them. The connections are one of the first things you should take care when starting your online journey, not just for the help you can receive, or new things you may learn, but also for the benefits in terms of friendships. Do you already know all these powerful bloggers? Oh wow! Thanks for sharing this! Am super honored to be mentioned and I highly appreciate it. You really got a huge list of bloggers here (except me) and they rocks! Keep it up man and thanks for sharing once again. I feel happy that I do network with all these 8 bloggers through commenting and sharing their posts. I do ask some many doubts to Regi & Adam and they politely react with good answers. it’s great you are already familiar with all these names and I am glad Reginald and Adam are helping you. This is the power of reciprocity! This is a wonderful way to spread a little love in the blogging community. I’m certainly a fan of everyone listed here and read most of their blogs every week. It’s really amazing to watch how we have all progressed with our blogs and stuck with it even through all the Google updates and other distractions that can get in the way. Thanks for encouraging us to connect with one another. I am glad you enjoyed this list of amazing bloggers and I was sure you knew them all. Having connections and strong relationships really help with our blogging journey, and with a big circle of friends, you do not have to worry much about Google and its updates. Hello Erik, this is indeed a great list of great bloggers in the industry. I was aware of Harsh Agrawal, Adam Connell and Ryan Biddulph but other names were unknown to me. I am glad that now I know them. I would like to add one more name “Jeff Bullas”, he is also a great blogger & speaker from Australia. thanks for sharing your views on this list. I am glad you are familiar with some of them, and even happier to see you can increase your connections today with the others names you don’t know yet. You’re right about Jeff Bullas, it’s an amazing and powerful name on the internet. Really awesome list Erik. I’ve already been following Adam Connell’s Blogging Wizard for awhile now. He’s one of those bloggers that you can count on that will write in-depth objective product reviews. Plus his other content is outstanding as well. I see many people sharing just good experiences with Adam. Josh, thanks so much for the kind words – I really appreciate it! And Erik – big thanks to you for including me in this post, it’s an honor to be featured alongside such great company. Thanks for being here leaving your comment. What a fantastic list of bloggers Erik! Each one of them is well worth following not only on their blog, but across social media. Thank you for including me and for your kind words! I feel the same way about you. I love your writing and know you will always challenge and inspire me! I am glad you already know all the names featured in this post. and have a fantastic week! Wow, I’m honored to be listed with these awesome bloggers! Thanks so much!! I know all of them pretty darn well, and have been following each for years. All rock; they are kind, share of their insights, and have built large, loyal communities of readers who help to spread the word for them. That’s the great secret; giving freely, and the receiving part becomes so much easier. Having circles of good connections really help us for many things. I actually spotted your blog from (klinkk) and let me firstle complement you for your blog, I must confess you have a nice blog. All the listed personalities and blogs you mentioned above are kind of alien to me except Harsh Agrawal of ShoutMeLoud. All thesame the whole mention Personalities and blogs are nice ones. Thanks for introducing me to new Blogs and bloggers. I am glad you found some new connections to make from my blog post. You have done a nice job in collecting the top classy bloggers in a list. know that reginald in also in this list. He is really done a good job in such a short period of time. These bloggers are really great and worthy enough of following. I only know of four on the list and the other I would check them out later. Ryan, Adam, Reginald and Harsh of Shoutmeloud are such an exceptional talents. I love their creativity and approach to blogging. and it’s great you can expand your connections by visiting the blogs of the others name mentioned here. I just found you on Enstine Muki’s blog and what a pleasure it is to see many of my friends posted on this blog! I know most of them for a long time now and they are excellent bloggers! Sharing is caring! Thanks for posting them and I shall return!!! first of all thanks for connecting with me. and happy to see you already know most of the great names mentioned. You’re right, sharing is caring! Also called, the “power of reciprocity”! and I look forward to learn more from each other. Thanks for that great list of bloggers. Some I had already come across, but most were new to me – which is great. I look forward to learning more from them – and from you. I am glad you know some of the bloggers mentioned, while you have the chance to expand your circles by connecting with the other powerful names. I look forward to know each other! Nice share. I am a big fan of Ryan, The way he shares his stories is really great. I am familiar with all 8 and I read their blogs regularly. I am glad you know the others powerful bloggers. List is really awesome. I know many of them and regularly visit their blogs but a few are quite new to me not because they are not famous but I am not lucky enought to have gotten them earlier. That is why I never miss to read any list post on bloggers and blogs of our times because I know some will be good add in my list. Thanks a lot for sharing; you too are part of this list. glad to hear you already know most of these amazing bloggers. It’s a good opportunity to connect with those who are new to you. Got to see 5 new names! I knew about Ryan, Harsh and Reginald already, but the rest were just totally new! I am glad that I read this post because I now have FIVE amazing bloggers to follow! PS: I found this post on Klinkk! You found 5 new connections to make in this post! You got the spirit of this content. Yes, you’ve said it right! I have got the spirit of this content!!!!! My favorite bloggers are Harsh and Lisa,between them.. I am their regular visitor and learned so much things from them.. Thanks for sharing about other bloggers.. I will also try to read their blogs. thanks for sharing with us your favorite bloggers. Now you have the chance to create some new connections with the other powerful people. Harsh Agarwal and Adam Connell are my favourite bloggers. They have always provided great guides through their blog. Good to hear your favorite bloggers, Sudip. You have a chance to meet some other powerful people mentioned in this list. Erik, you missed “Elvis Michael” in your article. Great guy, I hear……. Lol all kidding aside, thanks for the great article. There are so many influencers out there right now, and im happy to be getting to know them one by one, mostly thanks to articles like these. increasing your circle of connections is always a good thing! Indeed the list can be very big, you named some of the finest personalities. Interestingly I know few of them and now all of them because of you. Going to check them out, out of all Ryan is my favorite, traveling is the best experience and I need to do it all. I’m glad you know some of the names mentioned here. You have the chance to connect with the ones who are new to you. Referring other elite bloggers is a awesome way of helping the newbie as you did. I am very happy to see Harsh in this list as he is an inspirational blogger for me. I know Ryan, Harsh and Chan in this list but all others are unknown to me. I am really great full to you as you introduced some other elite blogger who can help me as well as other blogger on their way. Thanks for taking the time to read and comment this post. This is a great list of 8 i must admit, Harsh Agrawal,Ryan Biddulph and Lisa Buben are my guys, i am always following their posts, i am working out something juicy for these 3. Great to know that, Emebu. They are amazing bloggers the ones you mentioned. This is really an awesome list. I’ll bookmark this page. I’ve been following 3 bloggers from this list but now I’ve more to follow. They all inspire keeping me up with this.. Thanks for sharing and great work. Great post to promote others Erik. And also the feedback that you have received is amazing. kind regards. I have been following these bloggers Thank you Erik For This post Keep posting. Great to hear that, Syed. Thanks Erik for the list these bloggers are indeed amazing, I have been following shoutmeloud for so long but now I will check on the rest too. thanks for checking out the bloggers here! 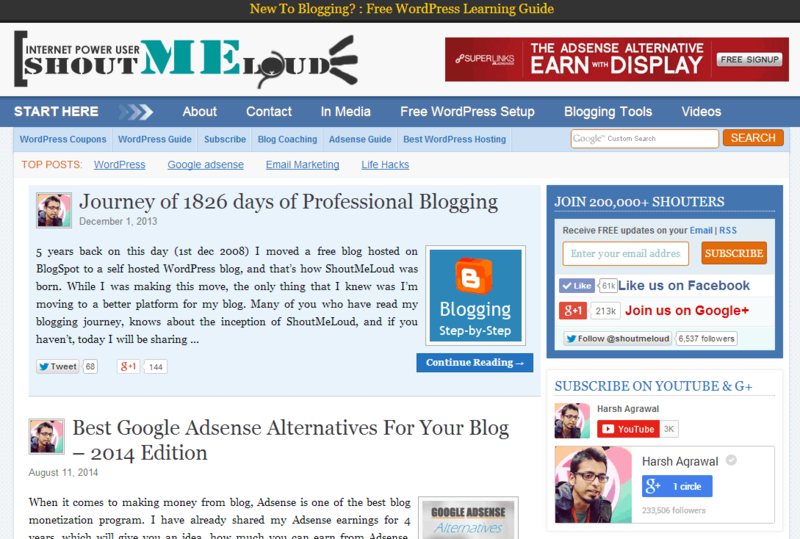 Every Bloggers Are Do Good Job And All Are Experts In Our Profiles. I”m Read Many Blogs Of Harsh Agrwal He Always Share Great Post With Us.